Sometime ago, this news shocked people…. It was about the wanderlust of the then President Pratibha Patil costing the public exchequer a whopping Rs 205 crore, surpassing the record of all her predecessors. It was at a time when she had four months to go and a trip to South Africa on the anvil – since assuming office as Nation’s first woman President in July 2007, Patil undertook 12 foreign trips covering 22 countries across four continents. Foreign trips of Heads of the Nation are inevitable – they do good for the Nations too … In the recent visit of Chinese Premier, Beijing registered a complaint with Downing St – can you imagine the reason ? Chinese Premier Li Keqiang is returning after a six-day trip to Britain and Greece that infused fresh vigour into China's ties and cooperation with the two countries and with Europe as a whole. In Greece, Li met separately with Greek President Karolos Papoulias, Prime Minister Antonis Samaras and Parliament Speaker Evangelos Vasileios Meimarakis. He also addressed the China-Greece Maritime Cooperation Forum, expounding China's views on maritime affairs. British and Chinese companies signed trade and investment deals worth some £14 billion ($23.8 billion) as Premier Li Keqiang continued a three-day visit to the U.K. to bolster business ties between the two nations. The 20-year agreement will see 1.5 million tons of LNG shipped to China each year from 2019, BP said in a statement. The contract with the U.K.’s second-largest energy producer shows China’s appetite hasn’t been sated by a $400 billion pipeline deal it made with Russia last month. Royal Dutch Shell Plc also signed a strategic alliance agreement. Deals from energy to finance totaling $30 billion were announced, according to China’s embassy in London. For its part, Britain said it will make it easier for Chinese visitors to apply for visas. Home Secretary Theresa May announced easier forms for visa applicants from China and an agreement to allow travelers from China or India to come to the U.K. on an Irish visa. Cameron visited China in December for the first time in three years, and was greeted with an editorial in the state-run Global Times newspaper stating that Britain “is just an old European country apt for travel and study.” In 2012, he was told he had “seriously damaged” relations by meeting the Tibetan spiritual leader, the Dalai Lama. Mr. Li, who arrived in London , began his official engagements with an audience with Queen Elizabeth II in her Windsor Castle residence. He then held talks with Prime Minister David Cameron and took part in the annual U.K.-China summit—a meeting of ministers from both countries, followed by a lunch with businesspeople. However, after receiving the plans for Mr Li’s arrival, Beijing registered a complaint with Downing St -because the red carpet being rolled out for the Chinese head of government at Heathrow airport was not up to scratch. A red carpet is traditionally used to mark the route taken by heads of state on ceremonial and formal occasions, and has in recent decades been extended to use by VIPs and celebrities at formal events. 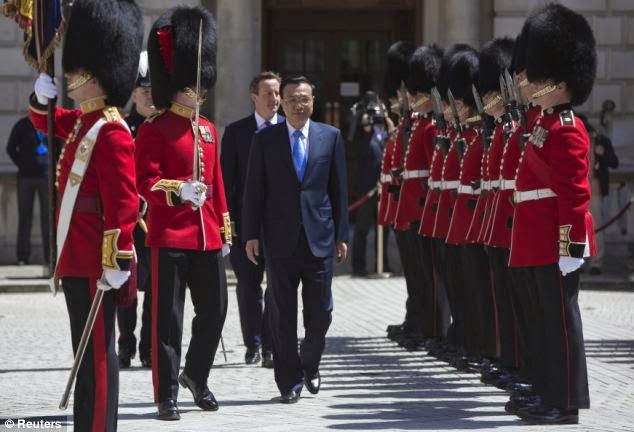 When the Chinese premier visited London this week he was greeted with an honour guard, a Downing Street reception and a meeting with the Queen. But one aspect of Li Keqiang’s welcome fell somewhat short in the eyes of Chinese officials – the red carpet rolled out for his arrival at Heathrow. After plans for Mr Li’s visit were shown to the Beijing government, aides complained that the carpet leading from the steps of his plane was not long enough. They saw a diagram of the arrangements at Heathrow and complained that the carpet was three metres too short,’ said one of the visit organisers. The objection was raised with Ed Llewellyn, the Prime Minister’s chief of staff, but he is said to have told the Chinese official he had other things to worry about. Mr Li is said to have demanded to meet the Queen, who welcomed him to Windsor Castle, despite the fact that it is relatively unusual for her to receive world leaders who are not heads of state. 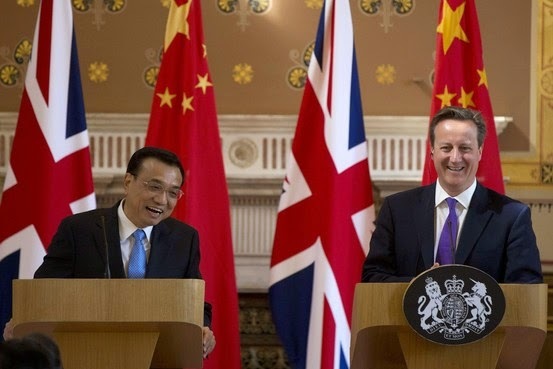 So, Chinese saw red because the carpet rolled out at Heathrow for Premier Li was 10ft too short……. China’s Foreign Ministry yesterday played down the diplomatic row over the length of the red carpet. The demanding requirement was perhaps surprising considering in December 2012 the current Chinese administration banned red carpets, welcome banners, floral arrangements and grand receptions for Chinese officials travelling domestically on official business. In Aug 2012, in a ghastly fire accident in a coach of Tamilnadu Express near Nellore more than 30 lives were lost. Railway Minister Mukul Roy – had to visit the spot but did so very reluctantly. More than 12 hours after the horrific train blaze, the Minister was still in Kolkatta citing poor connectivity to Nellore. From Nellore, he reached Chennai in a plush luxurious train coach. The New Indian Express reported of the royal treatment that Union Railway Minister Mukul Roy received after he arrived from Nellore in a special “luxury” train. It states that, the most important scene was played out when a worker brought a special doormat, which the guards claimed was made of wool, and placed it just beneath the door for the minister to step on as he exited the compartment.